Homemade Sriracha (fermented red pepper sauce) | Have YOU Ben Starr Struck? If you have a garden, like me, and have more than a couple of pepper plants, chances are in the early fall you’re INUNDATED with so many chiles that you can’t give them away fast enough. 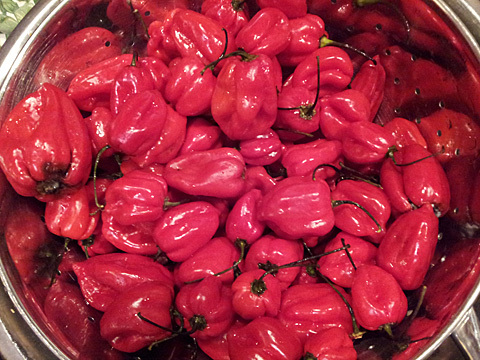 What on EARTH do you do when you’ve got pounds of hot peppers? If you’re me, you preserve them by turning them into sriracha, that rich, sweet, firey red pepper sauce from Thailand that makes Tabasco taste like a spoon full of bad vinegar. Sriracha is taking over the country…now you can buy it in any grocery store almost anywhere in the US. The gas station near my house sells it. If you’ve never tried it, you don’t know what you’re missing. The signature aspect of sriracha is its fiery red color, which means you need red chiles to make it look authentic. But if you have yellow or orange chiles, you can still make an incredibly delicious pepper sauce…it just won’t be red. You can make this sauce with ANY chile, from the mild poblano to the painful habanero, to the bhut jolokia (or Ghost Pepper)…one of the hottest chiles in the world. (My fabulous fan Rhonda shipped me a box of ghost peppers last year, and they are ageing as sriracha in my wine closet for another few years.) Virtually all hot pepper mature into a flavor other than green, so wait until they have changed color on the vine, then pick them. Stir well and cover with plastic wrap and let it sit out on your countertop for a few days. Eventually you’ll notice a change…bubbles coming up through the puree. When this starts to happen, stir the puree every day with a clean spoon and re-cover. 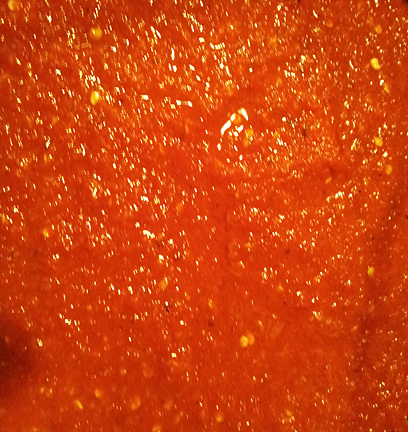 Let the sauce ferment for 14 days from the first signs of fermentation, stirring each day. Then strain the sauce into a large saucepan. This is easier said than done. You’ll need to work in batches using a rubber spatula, pushing the puree firmly through the finest strainer or chinois you have. Discard the seeds, skins, and large pulp that remains in the strainer. Bring the puree to a boil, then reduce the heat and simmer slowly 15-20 minutes to get rid of excess moisture and thicken the puree a bit. When it’s as thick as you like, remove it from the heat and let it cool. Taste it. It may need a bit more vinegar or sugar/honey, or both. It needs to have a perfect balance between sweet, sour, and hot. The homemade sauce should be kept in the fridge and it will last about 6 months or so. It won’t have the exact same texture as commercial sriracha, which is thickened with xanthan gum. But it will taste a million times better! This entry was posted in Recipes, Side Dishes and tagged bhut jolokia, chile, fermented, fresno, ghost pepper, habanero, hot, jalapeno, pepper, red, sauce, serrano, sriracha, Tabasco. Bookmark the permalink. Thank you for this recipe Ben! I had always put a mental note to try this and I finally did it. Haven’t tasted yet but it smells and looks so good! Just like the real thing. I am at the simmering with acv phase 🙂 will let you know how it tastes. I am SO excited! When I was growing up, I assumed I didn’t like spicy food because I didn’t like spicy Mexican food (other than sketchy Chinese food, there weren’t many ethnic restaurants in my area!) Then I moved to California and tried lots of different foods: Ethiopian, Indian, Thai, Vietnamese, etc, and discovered that I *love* spicy food, just not the spices I’d grown up with. The first time I went to a pho restaurant I wouldn’t even try the sriracha; now I turn the broth orange with it. Such an incredible flavor! Thanks for posting this recipe, can’t wait to try it! Wonderful, Nancy! I can’t wait!!! I’m one of those seriously-OCD shoppers who rarely deviates from the shopping list. Typically, the only provision I’ll make is for one impulse buy from the produce department- it always turns out to be something spectacular and tasty I never would have previously considered experimenting with. So I recently hesitated for far too long at the market, glancing at the shelf from the preordained first-time purchase of Fish Sauce to its neighboring product: Rooster Sauce. There was probably lip-biting on my part as I hemmed and hawed between the two, but I ultimately went with the one thing I *knew* I’d never make from scratch, that of course being the Fish Sauce. Apparently my senses were tingling that you’d post a recipe for an undoubtedly tastier rendition of Rooster Sriracha sauce! I adore the longevity of this recipe…you had me at “last about 6 months”. Peppers are one of the few things here in Alaska that are inexpensive, so I’ve already added this to my immediate ‘To-Cook’ list. Thanks, darlin’! I didn’t realize you were in Alaska. Wow! And I’m surprised that chiles are cheap there. I didn’t think your growing season was long enough to get chiles. Please let me know how your sriracha turns out, and what peppers you end up using!! !